Zoya Akhtar's upcoming film Gully Boy might get pushed due to its leading actors being occupied with other projects. 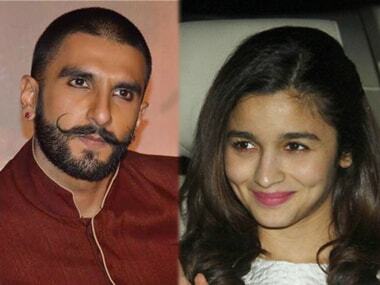 Based on the lives of street rappers from the chawls of Mumbai, the film is reportedly going to star Alia Bhatt and Ranveer Singh. However, due to the packed schedules of both the actors, the film will not go on the floors in the near future, as per a DNA report. Ranveer Singh and Alia Bhatt. Images from Twitter. Although Bhatt is shooting for Meghna Gulzar's espionage thriller Raazi, alongside Vicky Kaushal, she, reportedly, has Ayan Mukheriji's Dargon to film after her current project. Singh,too, is occupied with Sanjay Leela Bhansali's Padmavati. The period drama is also going to feature Shahid Kapoor and Deepika Padukone in leading roles. After Padmavati, Singh has Kapil Dev's biopic and another Rohit Shetty project in the pipleline. Therefore, Akhtar, might have to put Gully Boy on backburner to accommodate their dates. Bhatt had earlier expressed her excitement of working with Singh. Since she has already shared screen space with the actor in a couple of commercials, she knows what she is getting into. "Ranveer is a complete crackpot. I’m excited because Gully Boy is an emotional story, and our characters are very interesting, so it will be a unique combination," she was quoted as saying in an earlier report.